1 day 14 hours and 17 minutes!! 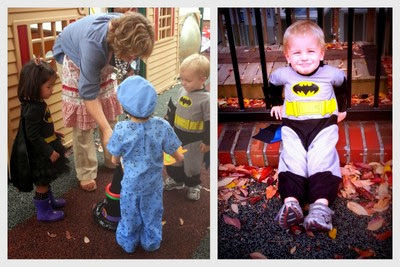 I did want to share a few pictures from our Halloween festivities though! Check it out!! There were TWO Halloween parties to attend. And, both were super cute and super fun! Party #1: Alex's Class! 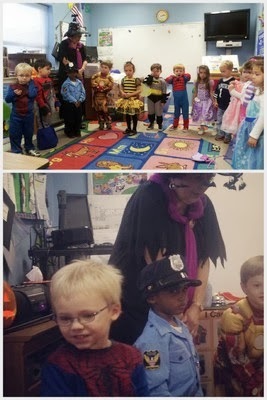 His teacher is dressed up like Martha Stewart. Too funny - love her :) Alex was pretty excited that 2 other kids in his class were dressed up like Batman - well, one was Batgirl. And, Alex cracks me up. He told me that "her loves me" Oh. My. 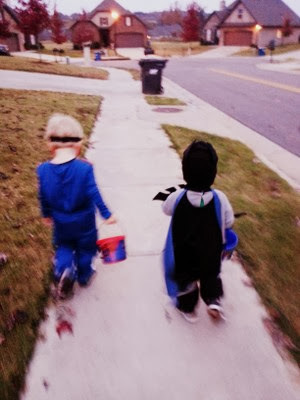 After the parties were over, I took the boys over to the Galleria to get their super cool (and FREE for dressing up) Halloween mini figure from the Lego store.While we were there, I noticed a few moms and their kids dressed up, too - but with trick or treat buckets... Interesting. I found out that a ton of stores were handing out candy. Fun! And, why not? We weren't sure if trick or treating was going to happen because of the weather...stinky rain stay away! So, we went to the car, grabbed their buckets, and got some candy. 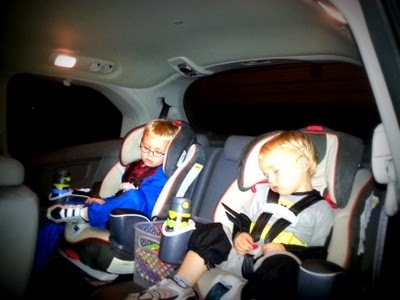 Of course, they were pooped from the day's events, so after about 20 minutes we headed home and I saw this as I was about to get them out of the car... So sweet! I let them stay in there, too. We are about 30 minutes away from the mall and they slept for about 30-40 minutes in the garage. Good thing! The rain is holding off and it is time to go trick or treating!!! The boys had so much fun!! 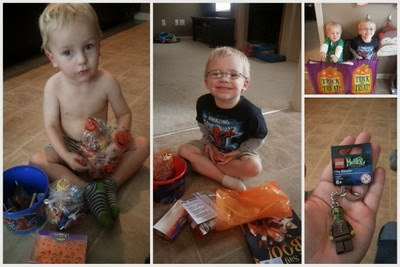 I am glad that Austin decided to stay put a bit longer so we could get our Halloween fun done. But, we are definitely ready for him to come on out of Mama!! Next time you visit our blog, you will get to "meet" Austin! !